The Grande Theatre of Rabat sits on the banks of the Bouregreg river in Morocco. Courtesy Zaha Hadid Architects. 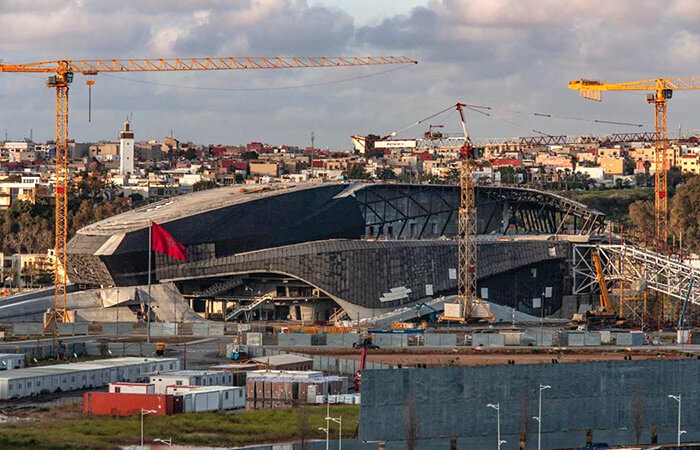 On the banks of the Bouregreg river in Morocco, the long-awaited Grand Theatre of Rabat will be completed later this year, transforming the skyline of the waterfront capital. Designed by architect Dame Zaha Hadid and her firm Zaha Hadid Architects (ZHA), working closely with several consultants, the theater—Hadid’s first project build in Africa—will stand as one of the late Pritzker Architecture Prize winner’s last and most enduring legacies. Hadid’s distinct style is evident here: undulating lines, curves, and fluid shapes that take cues from the adjacent river and Arabic calligraphy. 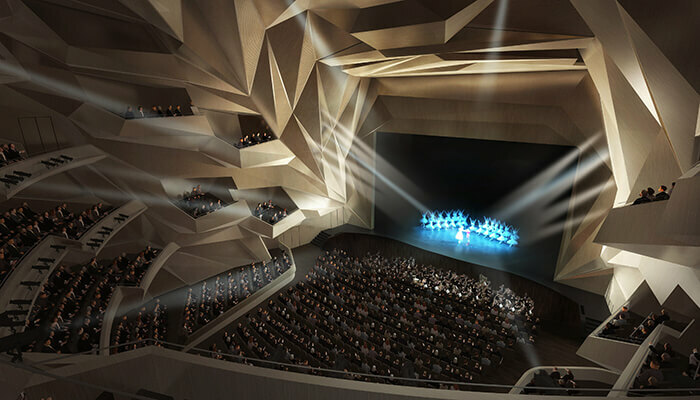 The project includes an 1,800-seat theater, a 7,000-seat open-air amphitheater, a smaller theater, workshop spaces, and a restaurant with panoramic views. The main auditorium displays a crystalline geometric pattern inspired by traditional Moroccan muqarnas—the ornamental vaulted ceilings often seen in Islamic architecture—yet its overall form is futuristic. The main auditorium. Courtesy Zaha Hadid Architects. The theater is part of King Mohammed VI’s national cultural-development program, which calls for integrated and sustainable development of the Bouregreg valley, including Rabat and its twin city of Salé, located across the Bouregreg river. An early building phase. Courtesy Zaha Hadid Architects. The design team’s challenge was to create a sense of naturalistic fluidity and an intuitive guide to visitor circulation flow. “Because the surrounding landscape is prone to seismic activity, ensuring structural stability was paramount,” says Reda Kessanti, senior designer with ZHA. “The theater is built as a ‘box in a box,’ in which the internal spaces are structurally isolated from the exterior. The concrete cladding is supported by a grid of ribs and a steel infrastructure spanning the building’s unusual shape. The building envelope is sculpted from the upper part of the amphitheater; its terrace offers a magnificent view of the valley.” Deep pilings also provide structural sturdiness in this riverine landscape. The light-filled lobby. Courtesy Zaha Hadid Architects. Light is essential to the design, a departure from the stereotypical dark and boxy theater space. “Cove lighting snakes around the curvilinear facade, and skylights and large-scale glass entrances allow the building to glow from within,” Kessanti says. Inside the theater, floodlights emphasize the auditorium’s faceted golden walls, while outside, visitors wander through a stepped amphitheater subtly lit with continuous lighting at the stairways and balustrades. 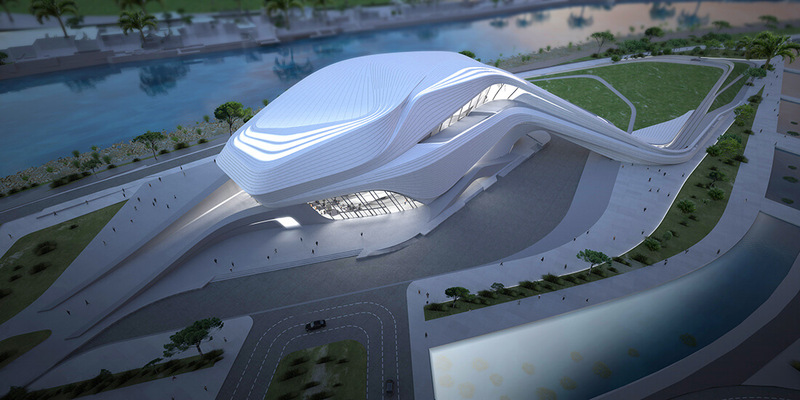 Hadid was known for her innovative designs that were often difficult to get built—the Grand Theatre is designed in this tradition. Because of the building’s unusual shape and diverse programming needs, 3D modeling was essential. “The project started out using a traditional 2D format, but during the detailed design stage in 2014, local architecture firm Omar Alaoui Architectes recognized that the complex geometry of ZHA’s design would require deeper coordination in 3D,” Kessanti says. Learn how ZHA uses custom workflows to implement BIM models. 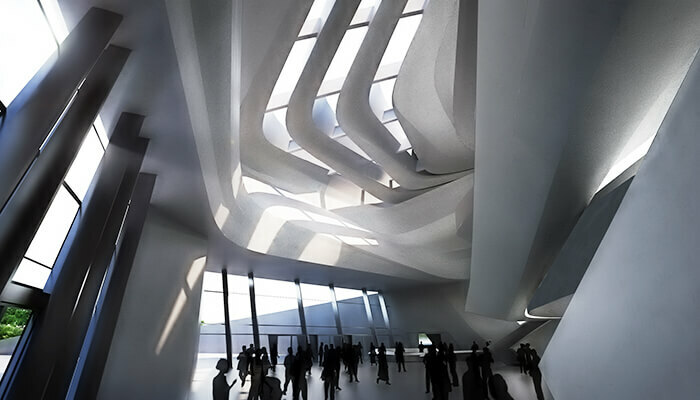 ZHA set up a dedicated BIM group that worked together in live workshops to resolve the geometry of the building. A bespoke Revit plug-in, ZHA BIM, was developed to extract the original geometry from 3D modeling tools, including Autodesk Maya, and make it possible to attribute information and specifications to the 3D components. Construction is slated to complete in late 2019. Courtesy Zaha Hadid Architects.